A device clipped to a person’s ear will deliver small amounts as a way to banish pain caused by the autoimmune disease, researchers say. Small doses of electricity delivered through a clothespin-like device clipped to a patient’s ear is being tested as a way to banish pain caused by lupus in yet another test of the emerging, drugless strategy known as bioelectronic medicine. This form of therapy was pioneered at the Feinstein Institute for Medical Research in Manhasset, the site of the new pilot clinical trial for lupus. Medical investigators there theorize that infinitesimal doses of electricity can be used to correct a vast number of medical disorders that, like lupus, have inflammation at their core. Using electrical stimuli in tiny doses has already helped mitigate the pain and swelling associated with rheumatoid arthritis in a small European clinical trial. The study was based on theories from the Feinstein Institute. The new lupus study, which has just gotten underway, is enrolling patients for the innovative, nonpharmaceutical treatment to combat pain associated with the serious and sometimes fatal disorder. The research is the first ever to study bioelectronic medicine as a way to address the inflammatory, autoimmune condition. Plans for the clinical trial were first disclosed during a roundtable meeting at the Feinstein Institute in November 2016 by Dr. Cynthia Aranow, the study’s lead investigator. It has taken until now, however, to organize the analysis in which patients will be treated with a sophisticated ear clip. 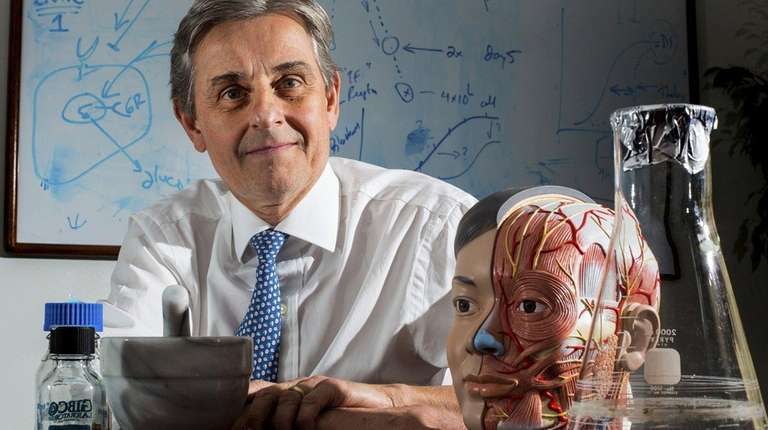 “This involves stimulating the vagus nerve through the ear, the auricular branch of the vagus nerve,” Aranow said of a nerve targeted for its importance by the institute’s president and chief executive, Dr. Kevin Tracey, a global pioneer in bioelectronic medicine. Tracey has long underscored how the vagus nerve controls immune system function. Inflammation is rampant in lupus, rheumatoid arthritis, psoriasis, psoriatic arthritis, atherosclerosis, periodontitis — a disease of the gums — and host of other, difficult-to-treat medical conditions. One out of every three patients in the study will not receive bioelectronic stimuli and will serve as controls in the research. “Patients are receiving a five-minute stimulation for four days in a row, and they come in on Day Five to see if the effect lasts,” Aranow said. Lupus is known as an autoimmune disease because it betrays the body via turncoat components of the immune system that launch a sustained assault, attacking the patient’s joints, skin, kidneys, heart and brain. Musculoskeletal pain is one of the key hallmarks of the disorder. The condition affects women in a 9 to 1 ratio compared with men, and women of color — African-Americans, Latinas and Asians — are often more aggressively affected, Aranow said. Lupus not only is incurable, but is notoriously difficult to diagnose and treat. New therapeutic strategies are desperately needed, she said. The Feinstein Institute team of investigators hopes to treat patients by stimulating the inflammatory reflex — discovered by Tracey — a circuit of nerves that maintains and regulates the body’s immune response. The aim is to inhibit production of a key molecule responsible for inflammation in lupus. Tracey pioneered bioelectronic medicine, based on the theory that stimulating the inflammatory reflex with an infinitesimal dose of electricity can help the body correct inflammatory problems, and heal itself. He also was part of the team that developed the clothespin-like device that is being used in this study.